Adini, I. and Ghosh, K. (2015). Mouse Retinal Whole Mounts and Quantification of Vasculature Protocol. Bio-protocol 5(15): e1546. DOI: 10.21769/BioProtoc.1546. Angiogenesis is the formation of new blood vessels from a pre-existing vascular bed. It is a multi-step process beginning with enzymatic degradation of the capillary basement membrane, followed by endothelial cell (EC) proliferation, migration, tube formation, assembly of a new basement membrane, and pericyte stabilization. Aberrant angiogenesis plays a major role in the pathogenesis of many diseases. The regulation of this complex process is an important therapeutic target. 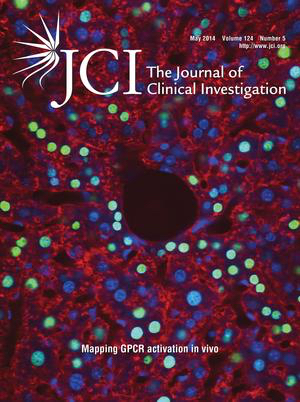 Success in this pursuit, however, requires the development of in vivo angiogenesis models that provide a reliable and facile platform for mechanistic studies of angiogenic regulation as well as drug development and testing (Carmeliet and Jain, 2011). Postnatal development of mouse retinal vasculature offers a unique and powerful in vivo angiogenesis model because, unlike other species, mice undergo extensive angiogenesis-dependent maturation of their retinal vessels after birth. As such, this model is also very useful for the mechanistic study of embryonic vascularization (Stahl et al., 2010; Adini et al., 2003). This protocol describes the steps involved in the whole mount processing of mouse eyes for visualization of the retinal vasculature. Microscope: Nikon Eclipse TE-2000-E fluorescence microscope or Zeiss Inverted Tissue Culture Fluorescence Microscope. In order to visualize vessels and blood flow (leakage of blood as example), perfuse the animal for 10 min by intravenous (IV) injection (200 μl/25 gr of animal) of 20 mg/ml FITC-dextran (2,000 kDa lysine fixable at 20 μg/μl in saline). (Animals should not be anesthetized because anesthetics cause reduced heart rate and blood pressure, requiring longer perfusion times). Euthanize the animal by using CO2 10 min after IV injection. Enucleate the mouse eye by pulling apart the eyelids, and placing a curved forcep under the eyeball. 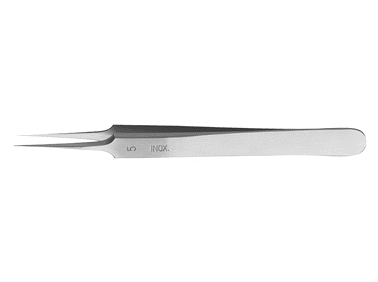 Close the forcep and grip the connective tissue and optic nerve, being careful to avoid squeezing the eyeball, and gently pull the eyeball from the orbit. Place the eye in 10% Formalin (or 4% PFA) overnight at 4 °C to fix the tissue. Wash eyes after formalin-fixation 3 times for 15 min with shaking at room temperature in PBS. After washing the fixed, enucleated eyes, remove the cornea, iris, lens, sclera, and choroid (primary cut around the limbus). Use an 18G needle to make a small hole in the posterior of the limbus. 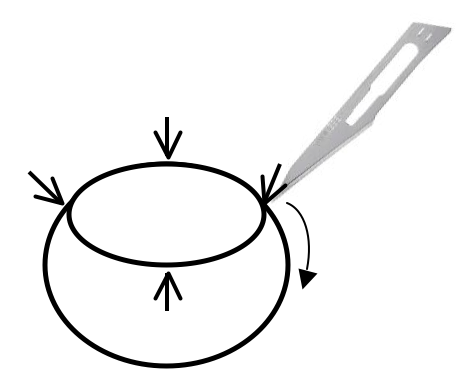 After puncturing the limbus, use micro-scissors to cut around the circumference of the limbus. After finishing the cut, use forceps to remove the cornea, iris, lens, and sclera. 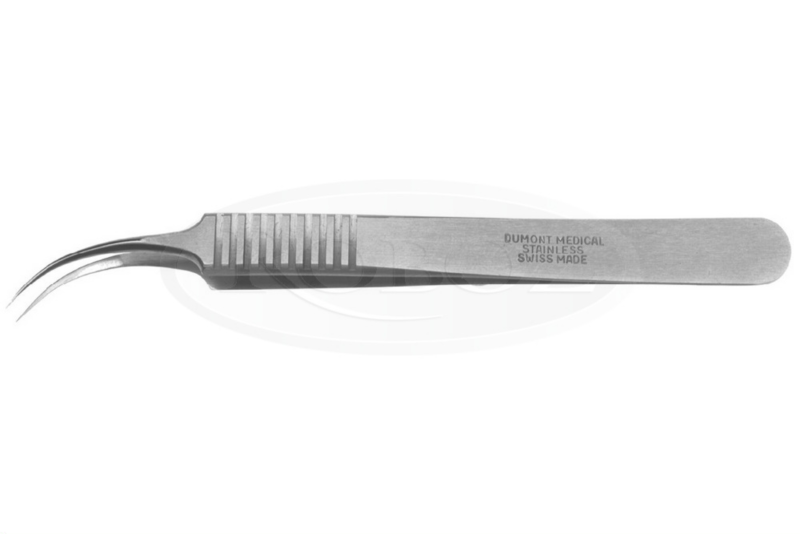 Extract the vitreous gel using micro-forceps, or by gently squeezing the. In order to free the retina use two pairs of micro forceps and go around the edges to separate the retina from the eyecup and then gently squeeze the retina out. If necessary, remove the hyaloid vessels with micro forceps (Figure 1). Incubate tissue (retinas) with blocking buffer (materials and reagents) for 1-3 h.
Incubate retinas overnight at 4 °C under gentle agitation in blocking buffer containing BS-1 isolectin (LEC)-TRITC [incubation longer than overnight (12-24 h) may increase nonspecific fluorescence]. Wash retinas 4-5 times (1 h between washes) in PBS at room temperature on a shaker. In order to flatten and mount the retina under a coverslip, make four incisions as shown in Figure 2. Place the retina onto a slide with the eyecup facing up, and cut the retina in each quarter with a micro-scissor. Using a wide-bore plastic Pasteur pipette, remove excess PBS and spread the eyecup open like a flower. Add 1 drop (around 10 μl) of mounting media over the retina and cover with a coverslip. 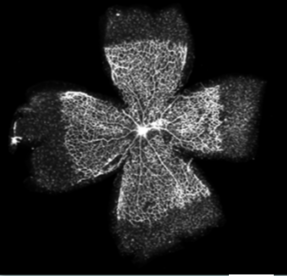 Images of flat-mounted retinal vascular plexus are acquired with an epifluorescence microscope. To capture 3D images of the retinal vascular plexus, use a confocal microscope fitted with a CCD camera. A 5x or 10x objective offers the best image resolution for Angio Tool software. Angio Tool image software can be used for quantifying numerous features of the angiogenic vessels including vascular density, number of branch points and tip cells, and others (Zudaire et al., 2011). Figure 3. Representative whole mounts retina. Retinas were dissected and labeled (Alexa Fluor 594-conjugated isolectin). Scale bar: 1 mm (<5% the quality of the fluorescence-labeled are poor). Thoroughly washing the retinas after labeling with BS-1 (LEC)-TRTIC is critical, do not reduce the washing step. This work was adapted and modified from previous work supported by US Public Health Service NIH grant HL071049 and part by a grant from the NIH (R01EY012726). Carmeliet, P. and Jain, R. K. (2011). Molecular mechanisms and clinical applications of angiogenesis. Nature 473(7347): 298-307. Stahl, A., Connor, K. M., Sapieha, P., Chen, J., Dennison, R. J., Krah, N. M., Seaward, M. R., Willett, K. L., Aderman, C. M. and Guerin, K. I. (2010). The mouse retina as an angiogenesis model. Invest Ophth Vis Sci 51(6): 2813-2826. Zudaire, E., Gambardella, L., Kurcz, C. and Vermeren, S. (2011). A computational tool for quantitative analysis of vascular networks. PLoS One 6(11): e27385. How to cite: Adini, I. and Ghosh, K. (2015). Mouse Retinal Whole Mounts and Quantification of Vasculature Protocol. Bio-protocol 5(15): e1546. DOI: 10.21769/BioProtoc.1546.